We can print your pictures to any size or proportion from a 6x4 inches to 3m x 1.8m mural sized. For optimum results, we suggest using Photoshop to resize your images, including any required borders, before uploading them. 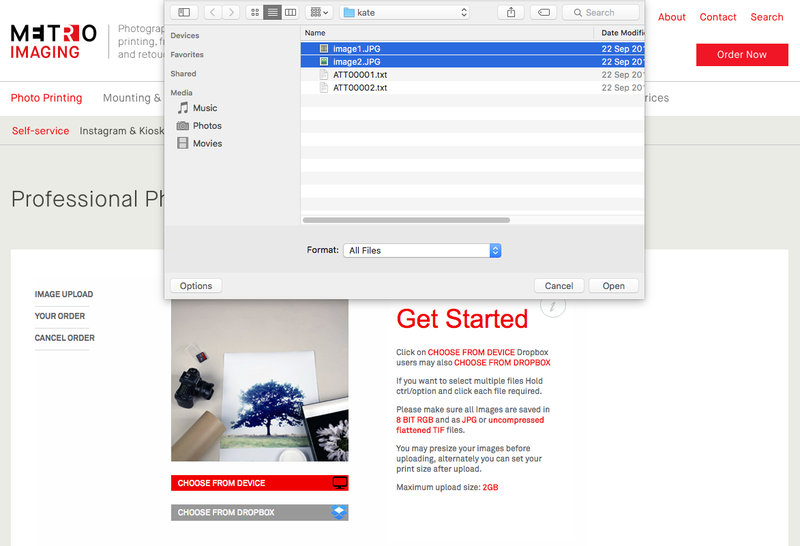 If you don't have access to Photoshop, don't worry - simply upload your original images, and choose from one of the set paper sizes in the drop down menu, or manually enter a custom size. The DPI of your image at the chosen size will be displayed before ordering. Generally an image DPI of over 200 is better. But over 150 should be fine. 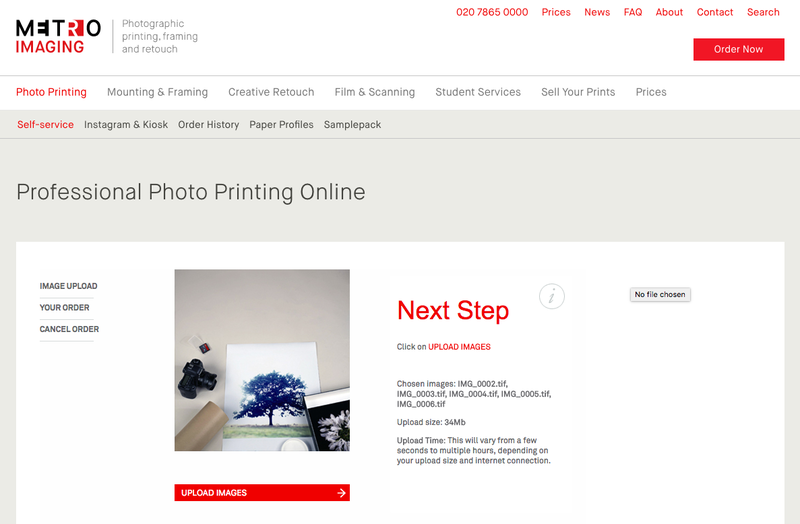 We offer professional C Type papers, which are suitable for the majority of photos, as well as Metallic, and true Silver Gelatin Resin or Fibre based paper for your black and white images. 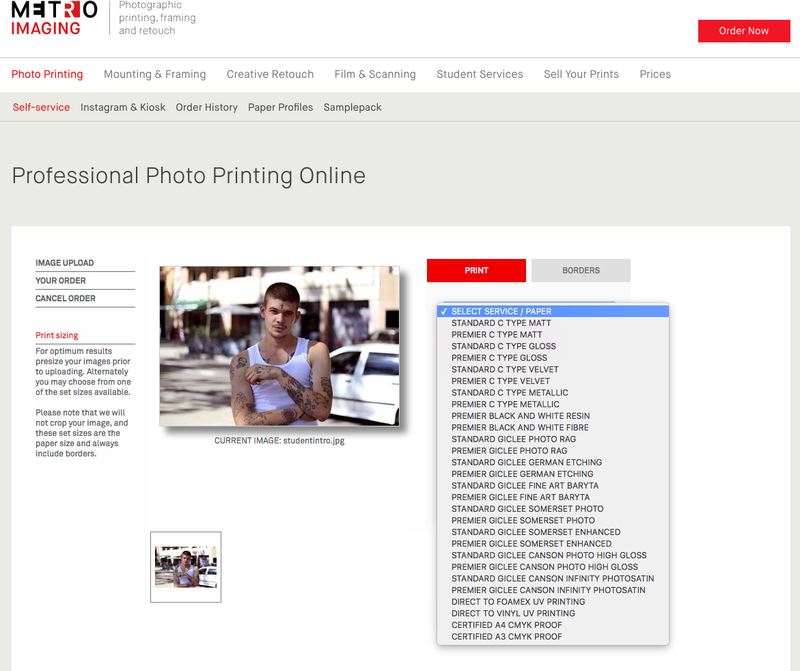 For fine art images, or copies / editions of your image or artwork, a Giclee print is the preferred option, with the paper type Hahnemuhle Photorag being the "Industry Standard". Please ensure that file names on your images only include letters, numbers, dashes and underscores. Files uploaded containing special characters such as '!#@' will fail at the next stage, generally showing a small thumbnail and the message 'not available'. This means you won't be able to proceed with the order. Depending on your file size and the speed of your internet connection, your file upload may take from seconds to hours. Users with a Fibre based service generally have a good upload speed. Standard broadband will be somewhat slower. 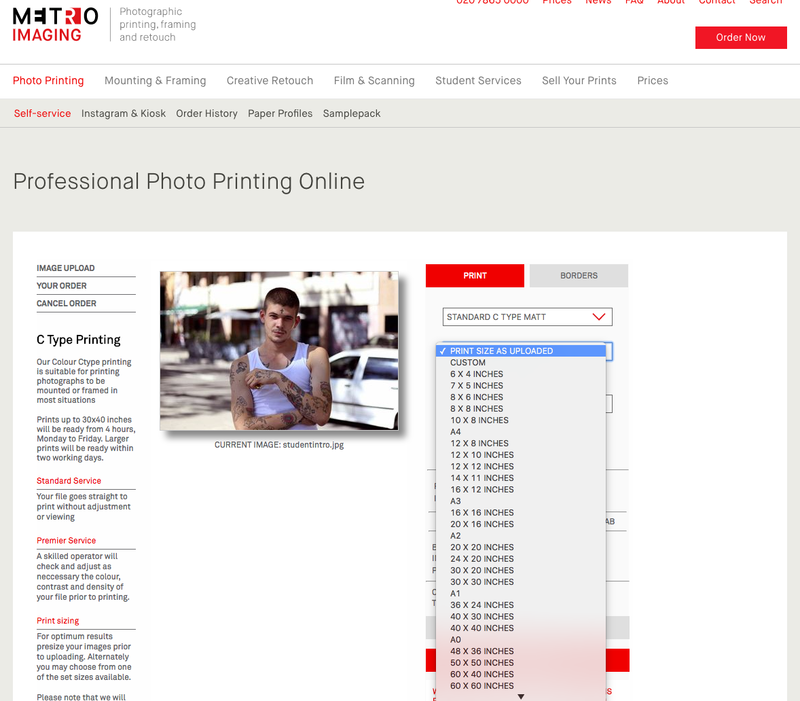 Upload either your resized images, or choose a print size if using your unedited version. Choose a paper type. Add mounting or framing if required. Complete your details, choosing collection or a delivery service and complete your order making a secure online payment at Sagepay. 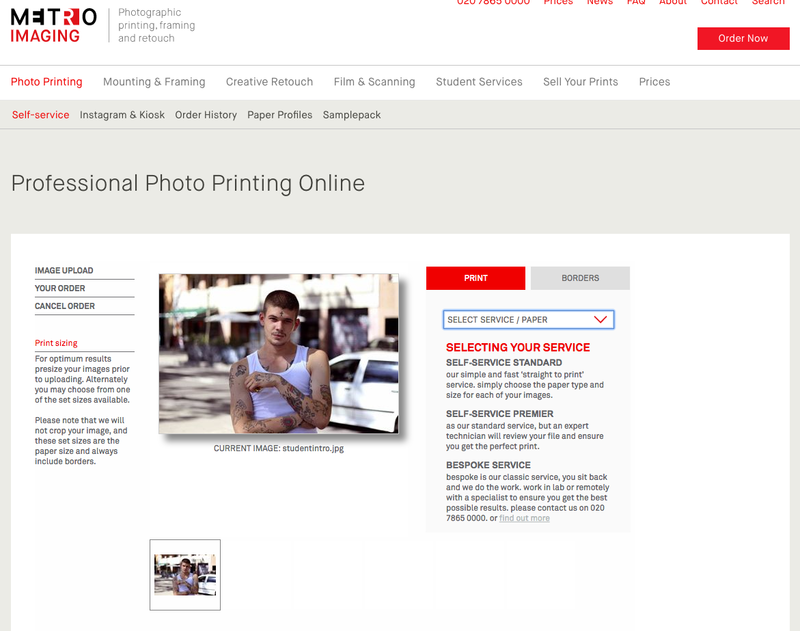 As our standard service, but an expert technician will review your ﬁle and ensure you get the perfect print. You can use our Bespoke Service if our Self-Service options aren't suitable for you. If you require your images cropping to a set size, or you'd just rather a professional handled the whole sizing and ordering process for you. 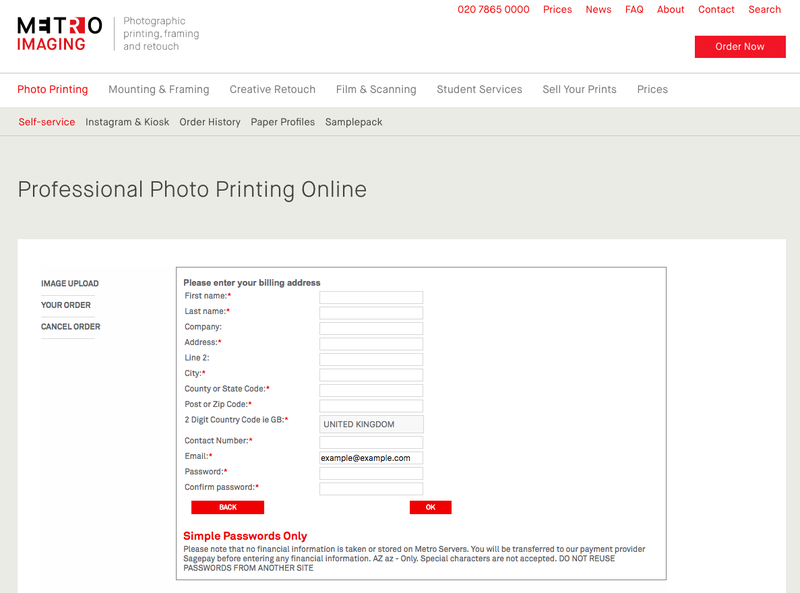 You can still submit your images online, or if you prefer, contact us and make an appointment to visit us in London EC1 (Near the Barbican). Our Fuji Crystal Archive C Type matt and gloss papers are perfect for photographic exhibition printing and the ideal ‘all rounder’ paper type. They are most suitable for traditional photographs, whether landscapes or portraiture, but not for illustrations. Standard C Type Matt or Gloss prints are suitable for nearly all types of photographic mounting and framing, and can be produced up to 1.8 x 3m, allowing for mural size prints. 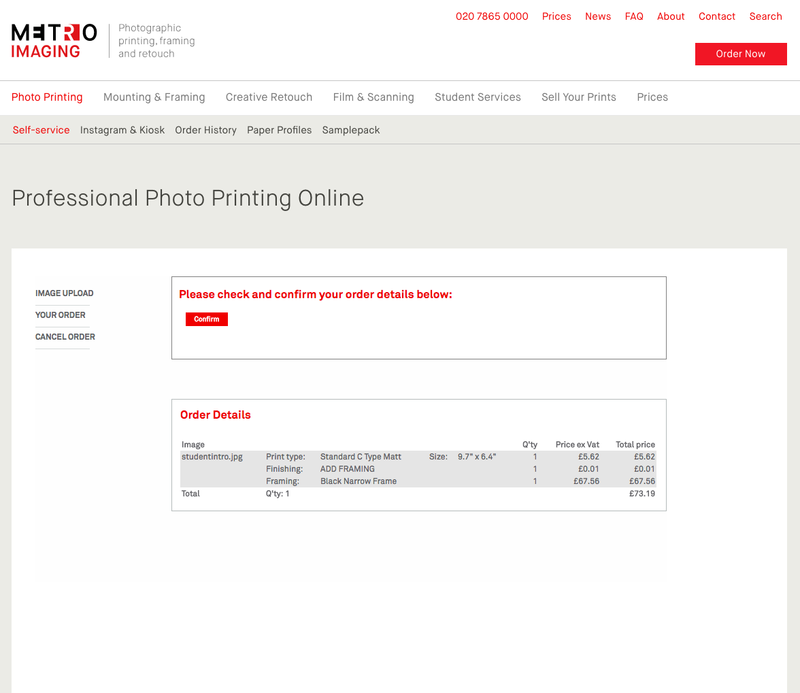 We also offer a variety of specialist C Type photographic papers including Flat Matt Fuji C Type Velvet prints, and Kodak Metallic C Type printing paper, which has a High Gloss surface with a slight metallic feel to it. 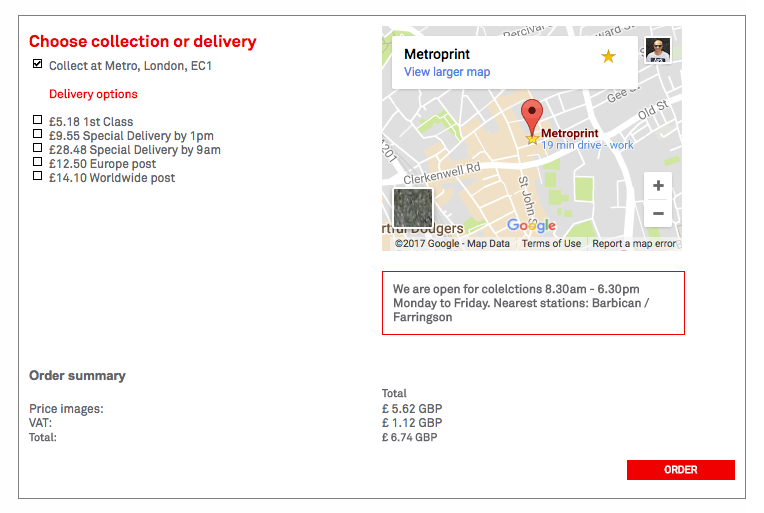 Metro is the only lab in the UK where you can order true Silver Gelatin black and white resin coated and fibre based bromide printing from digital files. If you want a colour cast free, genuine black and white print then our resin coated, or fibre based paper is for you. For most people, black and white resin coated paper will be suitable for printing, and can also be mounted to a variety of materials, or framed. Silver Gelatin Fibre prints would be used for exhibiting, and for sale to collectors. Usually these prints would be framed, or supplied ready to frame. Direct to Foamex (UV) printing is an inkjet print, using UV cured inks onto any flat surface. Online we only offer Foamex or Vinyl up to 1m x 1.5m. But via our Bespoke services we supply a range of materials for printing on to, up to 3m x 2.5m such as Dibond, MDF, Aluminium and Perspex. Or we can print to your supplied material. Dependent on the material used, these prints are weatherproof and can be used for outdoor displays. Direct to Vinyl (UV) printing is an inkjet print, using UV cured inks onto self adhesive vinyl. 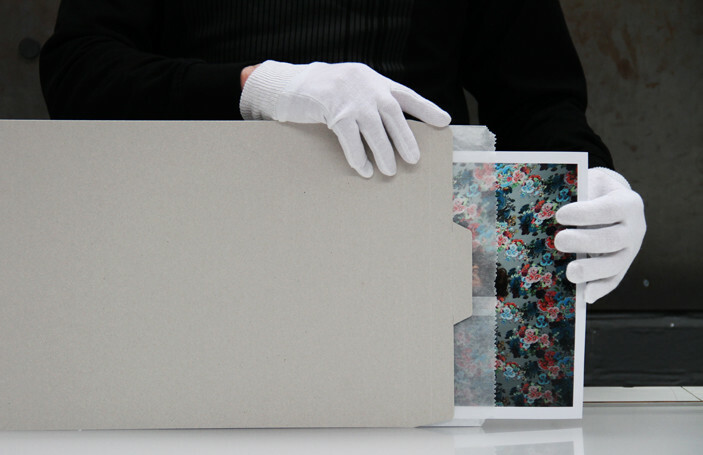 Printing straight to vinyl can be an economic way of printing large photographic exhibitions. The system automatically picks up the size of your image, which will be displayed. 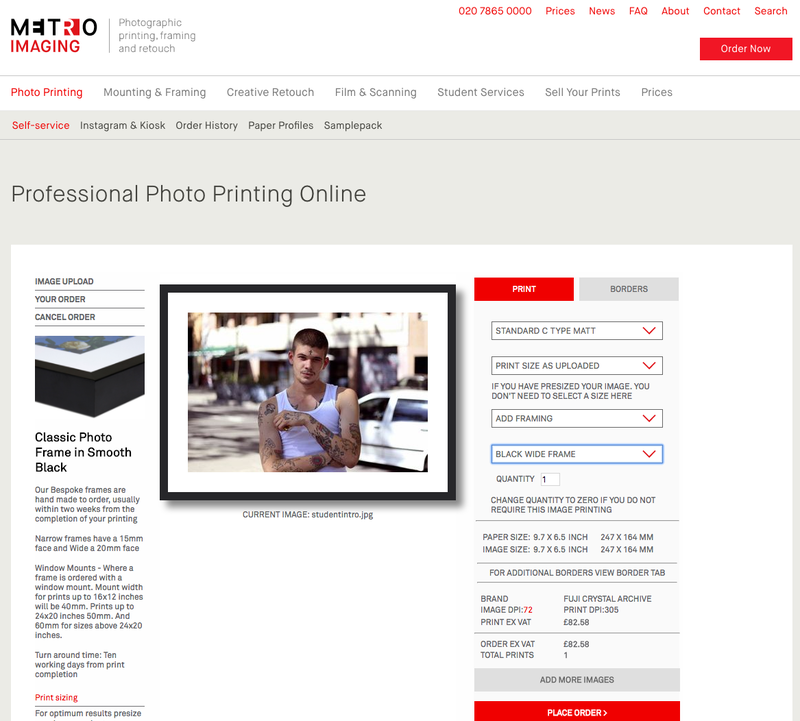 We never crop your image, so the set sizes always include a border, and the print size refers to the paper size. 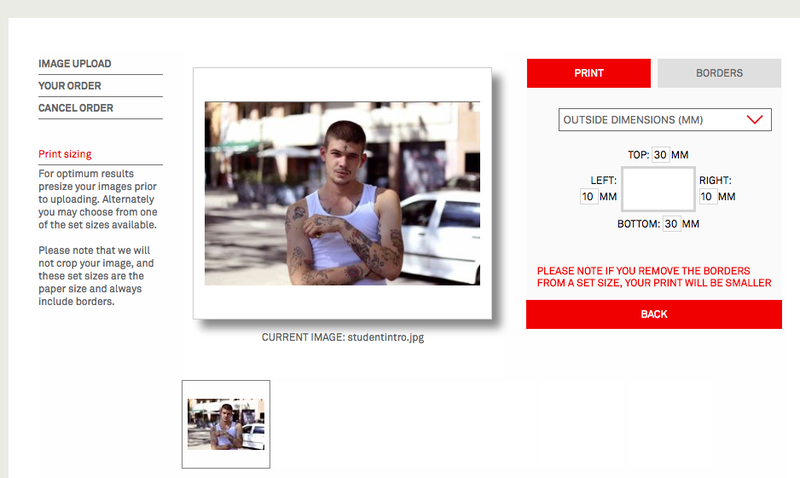 The image size within the print will be slightly smaller depending on the proportions of your image. By choosing custom sizing you can define either dimension in MM, the other dimension will be set automatically. By choosing the Borders Tab you can also add additional borders, either within the current dimensions, or in addition to your print size. We also offer a photo framing and mounting service that’s specifically tailored to the needs of the most discerning customers. This method of end-to-end solution, based upon your budget and requirements has worked successfully for international galleries, high profile artists and photographers, private and corporate collectors and major institutions. Please take a moment to double check your order. 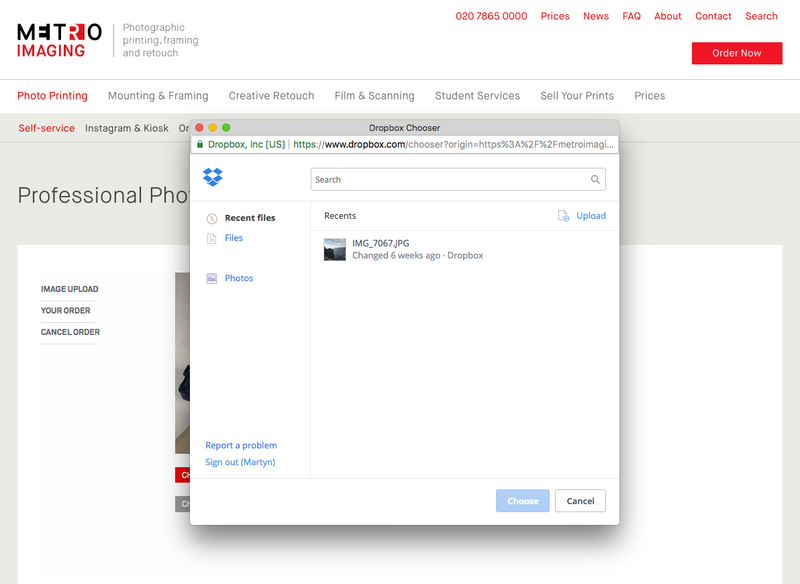 If you've uploaded some images and decided not to go ahead with all of them, or have forgotten to select a paper type etc, you'll get a Pop Up message here alerting you to this. Once you have confirmed the details, enter your email address. Previous users will then just need to enter their password. A password reminder button is available. New users will just need to complete a few brief details. After clicking 'United Kingdom' for example, you should see your Countries ISO code displayed. ie for the United Kingdom this will display as GB. Should your order fail at the next step, this is quite likely the reason. Click on 'Change Info' and you can update this and try again. US Customers will also need to enter their 2 digit state code, ie FL for Florida. While our system does allow your invoices to be later printed, and paper types used recorded. We do not take or store any financial information on our server. All payment information is entered directly to the Sagepay website and server. Hence we only allow simple letter and number password combinations. But for safety's sake, please do not reuse an important secure password, that you use elsewhere! As soon as your order is completed, we'll send you an email confirming it is either ready for collection (We're open Monday to Friday 8.30am to 6.30pm) or outlining your delivery details. Please check your junk mail folder, as they can sometimes end up in there.